I've seen more than a few threads here where people say "ditch the bio balls" and "bio balls cause nitrate problems". As someone who has used bio balls in my wet/dry for over 15 yrs...and never had a nitrate problem, where do people come up with this? Is it first hand experience or something you read elsewhere posted by someone who knew someone who's uncle's brothers wifes sister daughter had nitrate problems. I don't get it. I have a sponge over my overflow with prevents crap from getting to my sump and I do biweekly water changes. So, can those people that say "ditch the bio balls" let us know about your bad experience and we can compare notes. Here's a pic of 15 yr old bio balls (which have never been removed from where you see them) and my $2.00 kalk doser. I think bio balls are fine as long as they are keep fully submerged. It's when they are exposed to air when the nitrate rises. I have bio balls in my refugium and I plan on getting live rock instead but not because of nitrates. I dont know what the argument is. I had a wet dry a good while ago except I had filter media instead of bio balls. The end result of the cycle is nitrates. Then the only way to get rid of those is a denitrater or skimmer or a refugium (macro algea) or what a lot of people use is a PWC. I think that is why people are so against wet drys because they call them nitrates factories. That is why I got rid of mine and went with the refuge and also got to get rid of denitrator. Just my view. Bio balls build up nitrates when they are submerged. When submerged they can easily collect food particles and waste. If you have a sponge over the intake then I am sure they work as they were designed. I had bioballs in the beginning. I replaced them with LR shortly after but I never had a problem with them. I was just told that LR would work better. Interesting. Bio balls are made to be exposed to the air...thus the term wet/dry. I'm not really sure how one even goes about submerging them.....they float. But anyway, have you tried using them both ways and have you seen any diff in nitrates, assuming of course you followed the same maintanence preceedures on your tank for both methods. The problem isn't really that bioballs create the nitrate issue, it's moreso the lack of proximity to denitrifying sources. If you have a straight forward wet/dry with nothing immediately following (refugium space, LR and so on) then the next source is in the display tank itself. This is rather far away in terms of bacterial proximity and in many cases just a sandbed is present. Although denitrifying bacteria can "set up shop" just about anywhere in the tank, there will be insufficient numbers present unless area's are created specific to their needs. The closer you can get the varying types of bacteria together, the more efficient the process becomes. If you have an area such as a wet/dry in one area and the denitrifying area is a completely different space, the process becomes inefficient due to the time it takes for the nutrient to reach the areas that can convert nitrates to less harmful nitrogen. Keep in mind that bacteria is also a very slow and inefficient process to begin with. Even though Mother Nature has a very complex system for this process, it is not all that timely considering what we throw at it. The best way to deal with the issue is to reduce the potential from the get go. This means export. The more you can reduce the organics before they enter the nitrogen cycle, the less the bacteria must process and the more efficient the system becomes. This can be accompished in varying ways but most efficiently is effective water flow, a quality skimmer proper (over)rated for the tank size and refugia for the harvesting of macro algaes or soft corals. I've never used bio-balls, but i have done a lot of reading, here on this forum and plenty of other sources as well. That and an uderstanding of the the denitrification process is what leans me toward advising aquarists against bioballs. I have a sponge over my overflow with prevents crap from getting to my sump and I do biweekly water changes. Bi-weekly water changes is pretty frequent, IMO. That alone can keep nitrates to 0. But IMO that is also a lot more maintenance than I want to perform on my tank. I'll also point out that I see LR rubble in the bottom of your sump. Does your main tank also have LR? 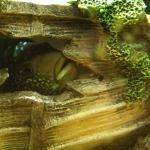 What about the substrate in your main tank? The LR rubble, and any LR in your display tank are providing areas of low oxygen for denitrifying bacteria to process the nitrates. But if you have a reasonable amount of LR and a proper susbstrate then there is also no real "need" for the bio-balls, and thus why I often reccomend that new set ups not use bio-balls. Why add another component that isn't necessary if the rest of the system will take care of things. W/d's can keep great water quality as long as they are maintained correctly. The inherent problem is listed above, they can collect food and other waste in places that it can only go to rot. As the food rots, the nitrate rises, so there's the term nitrate factory. I started with a w/d like many others and switched after a year or so of fighting with the water conditions. After switching to a dsb and sump, I've gone for months without a water change and had no detectable nitrate. If you keep a clean prefilter then the problem isn't as great. But I agree that bi-weekly water changes are a ton more maintenance than I want to do. I have a family and other pets to take care of. And I'm lazy. Bi-weekly water changes is pretty frequent, IMO. I guess everyone has their own methods for maintanence but a 10 gal water change only takes like 30 mins. I'll also point out that I see LR rubble in the bottom of your sump. There is some rubble there, but not a lot. It's what I use to attach frags. Does your main tank also have LR? 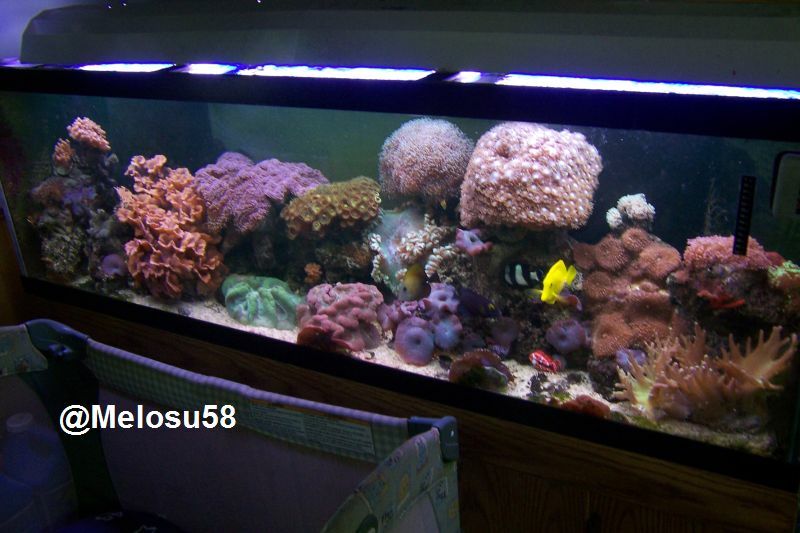 When I set up the tank I "think" I bought 50 lbs, but that was like 15 yrs ago and I've added some since then. I would take a guess and say there is about 75-80 lbs in there now. What about the substrate in your main tank? No substrate. Been bare bottom since day 1.